What Kind of Christmas Candy in Bulk Will You Be Stocking Up on This Year? When you’re trying to get something across to someone, say, the idea that the Christmas season has finally arrived, you’ve got to believe in what you’re doing! If you claim to be a world-class championship juggler, people are going to want proof! So you show them. And with Christmas, you’ve got to show everyone that you’re prepared. When you own a business, that’s going to involve decorating the premises and stocking up on Christmas candy in bulk to satisfy all your hungry customers! 1.) 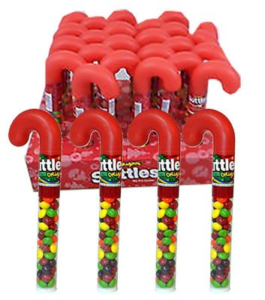 Skittles-Filled Candy Canes. Well these are fun! Great for stocking stuffers, these plastic candy canes are filled with rainbow-flavored Skittles! Simply too yummy. Each box contains a whole bunch of Skittles canes, so there will definitely be enough for everybody. 2.) Frosty Nerds. Everybody loves Nerds candy, right? How about winter-themed Frosty Nerds? The little pebble candies come in watermelon, cherry, and punch flavors, a perfect color combination for Christmas. We pretty much guarantee you’ll be satisfied with these tiny guys. 3.) Snickers Trees. Snickers does it for just about every holiday, and they’ve done it for Christmas, too! Snickers trees are classic Snickers candy bars—with their good old peanuts, nougat, caramel, and milk chocolate—but in the shapes of Christmas trees! Oh what fun! There’s a ton more bulk Christmas candy to explore at BlairCandy.com. So what are you waiting for? Dig into the holidays right now with Blair Candy! So you’ve made the perfect cake. It’s chocolate, it’s strawberry, it’s coconut. Whatever is it, you know it’s all it should be…except it’s missing like one more thing. It’s already baked, so you can’t really add anything to the mix. So what are you left with? Well, you’ll have to add something to the top, and we know just the thing! Butterfinger chopped topping would make that cake the best thing you ever made. And with its versatility as either ice cream toppings or cake topping, these chopped Butterfingers will be flying all over your kitchen! Now that we’ve got you all hungry for a cake with Butterfinger toppings, let’s discuss some baking ideas for the upcoming holiday season. What’s Christmas without some good old-fashioned baking? Our own thought is that these Butterfinger toppings would be just picture-perfect atop a thick, round chocolate peanut butter with chocolate frosting. 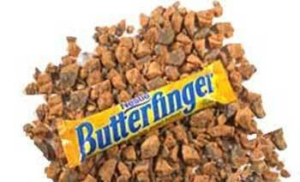 Just drop some chopped-up Butterfingers on it and, trust us, you will make a lot of people happy. Or, in keeping with the holidays, how about a red velvet cake with white icing and the Butterfinger toppings baked into the whole mix? That’s what we call “decadent,” no question. The thing about it is that Butterfingers are incredible on their own, but adding them to existing baked concoctions is going to make your Christmas! And don’t forget about ice cream toppings, too! Ice cream’s good all year round, so throw on some Butterfinger toppings and settle in for some frozen goodness! For all kind of amazing cake and ice cream toppings for this holiday baking season, stick with BlairCandy.com! Some things in life just can’t be questioned. Water is wet, fire is hot, and Vidal makes perfect gummi candy, period, full stop. We’ve always had a soft place in our hearts for Vidal gummies. They come in so many fun varieties and are always so perfect for the holidays. At Halloween they’ve got those awesome gummi eyeballs and body parts. Just too yummy! Now, for Christmas time, Vidal is back once again, this time with gummi snowmen! We have to say, these are especially awesome. Sugar-coated gummi snowmen in red and green flavors of strawberry and apple fill each of the 4.5-ounce bags. Each snowman is absolutely adorable, wearing a little hat and scarf for the winter. For only $1.50 a bag, these little guys will make great Christmas candy in bulk for business owners across the country who want to stock up their shelves with unique Christmas candy now, before the mad rush gets here. In fierce competition for Christmas candy, you just need to stand out and be unique, and the snowmen are certainly unlike most gummi candies you’ll find out there. 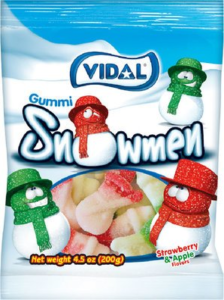 So if you want to draw the eyes of kids and adults alike in your store, stock up on a bunch of gummi snowmen from Vidal right now. With Christmas on its way, you’ll be happy you got this done early. And sneak a few bags for yourself, too! No lying: these snowmen really hit that sweet spot. Check out BlairCandy.com for more bulk Christmas candy! It’s traditional Christmas wisdom that everybody knows: if you’ve been nice all year, Santa leaves you nice presents and candy under the Christmas tree. But if you’ve been naughty, you get nothing but giant lumps of coal. Well now you can tell everyone you know that they’ve been naughty with net bags of Double Crisp chocolate coal candies from RM Palmer Candy Co.! It’s true, candy lumps of coal are somewhat of an old-fashioned holiday candy, but that’s exactly why they’ll make great Christmas candy gifts this year. People have sort of come to expect the usual Christmas candies, the Reese’s, the Hershey’s, the boxes of fine chocolates. It’s become accepted that everyone has been “nice” the past year and no one’s been “naughty.” But you have the chance now to change that perception, all in good fun! Chocolate coal will go great as a stocking stuffer, especially at the bottom of someone’s stocking, so they think they’ve been good, up until the last moment! Each piece of candy is wrapped in foil that makes it look like coal. 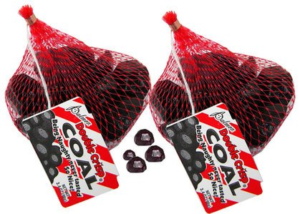 So have a little fun this Christmas with chocolate coal from BlairCandy.com, a wholesale candy retailer with decades of experience! People love to transform their clothing and houses around the holidays, decking everything out in festive red and green to welcome in Christmas. Isn’t it great how so many candies transform themselves at this time of year, too? Well hey, candy wants to have fun and celebrate right along with you! We see it kind of everywhere: Hershey bars come out with holiday designs on them. Reese’s Peanut Butter Cups morph into Christmas trees with Reese’s Pieces stuffed in them. And, as you can see above, Dots dress themselves all up in red and white and green and white color combinations! These holiday themes just get you in the spirit of the season. No one wants to be caught eating these candies in their looks from the normal parts of the year. If it’s Halloween, you want creepy candy! When it’s Christmas, you want holiday candy, period. Plus, Christmas candy is always a nice mental reminder that the holidays have returned, since you usually can’t find Christmas candies any other time of year. These boxes of Dots are also perfect for bringing along to the movies. Dots are an age-old movie theater candy. It’s sort of a given: going to the movies? Bring Dots. And as we all know, all the exciting, award-winning movies start coming out around November and December. 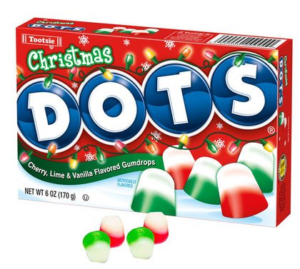 So settle into your seat this winter with a few boxes of these Christmas-themed Dots! Christmas candy boxes are really all the rage right about now, so you’ll be happy you stocked up. And for more themed holiday candy, stay with BlairCandy.com! The holidays are fun because—well, they’re fun for a whole lot of reasons!—but they’re especially fun because they allow you to combine the most delectable of foods with a certain amount of decorative artistic flair. Don’t tell us you don’t think about the presentation of your Christmas dinners just as much as the taste of them! So the same idea applies to your holiday desserts. If you’re plotting a few elegantly complex Christmas candy buffets this season, you’ll need candies themed to the colors of Christmas, namely red, green, and white. Luckily, Christmas candy is never boring, and you certainly won’t have trouble finding holiday sweets in any of these colors. We’d like to suggest cherry-flavored Color Splash lollipops as one ingredient in your candy buffet. 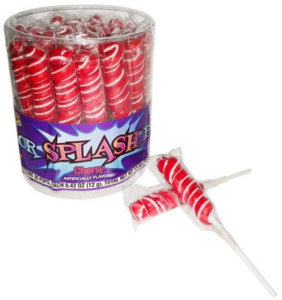 These red and white striped lollipops release a mouthwatering sugary cherry flavor into your mouth and will definitely hit the spot when you need something sweet this season. The bold red and white colors will be true standouts in your candy buffet, as people’s eyes will be drawn to them as reminiscent of Santa Claus or other red and white Christmas mainstay themes. So don’t let your Christmas candy buffets be dull and boring this year. Red and white Color Splash lollipops are all ready to celebrate the holidays with you! Shop for them and other Christmas-themed candy at BlairCandy.com! Hershey certainly has no shortage of holiday candy to offer up to the masses every Christmas. They make a ton of seasonally themed stuff (and we at Blair Candy truly can’t get enough). From Reese’s Cups stuffed with Reese’s Pieces to holiday-themed Hershey bars, the company just knows how to make candy. Now here’s an especially interesting Hershey product for the Christmas season: a giant (12 ounces!) hollow Hershey kiss that is just perfect as a novelty candy gift this year. And that’s really what we think more people need around the holidays, fun candy gifts! Why give a bunch of little Hershey kisses when you can dare to be unique and surprise someone with a giant Hershey kiss? 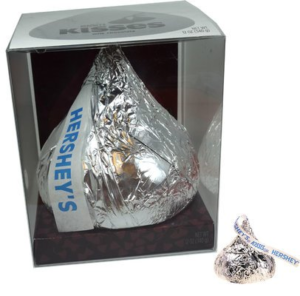 Each one comes in a big box and is presented just like the tiny kisses you already know and love, in silver foil with the “Hershey’s” ribbon streaming from the top. Hershey holiday kisses come together well, don’t you think? Trust us, these things are massive and will provide days, if not weeks, of delicious milk chocolatey feasting. Have a section of the kiss now and save some for tomorrow, and be prepared to come back again and again until it’s gone! You’ll make someone extra specially happy this Christmas with a fun gift like this. Order your Hershey holiday kisses before they’re all gone! Get yours at BlairCandy.com! Everybody loves a festive Christmas parade, right? There are tons of Christmas parades all over the country ever year during the holiday season. These are always a good time. Jubilant floats roll by the adoring crowds, showcasing local businesses and giving the people a chance to see lovable Christmas characters from Santa to Mrs. Claus to the eight reindeer. These parades get you ready for the holidays and just plain put you in a good mood. Now, if you’re a business owner, and you’re going to be sponsoring a float in an upcoming Christmas parade, you’re going to need some bulk candy to toss to the crowds. People love trying to catch thrown candy at parades and will be excited to go pick up what they don’t catch. Because candy will be flying through the air, it’s a good idea to get some wrapped bulk candy for your float. Luckily, Blair Candy has been distributing wholesale Christmas candy for many years. We know what we’re doing and how to do it right. 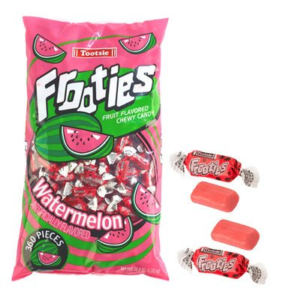 One fan favorite for Christmas parades is Frooties by Tootsie. These soft candy chews come in a ton of flavors, including blue raspberry, watermelon, strawberry, fruit punch, and grape. Each bag of Frooties contains about 360 pieces, so don’t be afraid to reach in and grab a whole handful to toss. The crowds will be happy you did! For all our Tootsie Frooties and even more wholesale Christmas candy, visit BlairCandy.com this season! Sometimes you just want to do things your own way. No one else can tell you how to do it; you just know how you want it done, and that settles it. That’s how we feel sometimes about old-fashioned Christmas candy. This type of candy has real character, bringing us back mentally to older, simpler times, maybe to our childhoods, when certain candies were made that aren’t really made or well known anymore. Washburn’s old-fashioned hard candies. Pink and white sugar popcorn. Gilliam candy sticks. Cella’s chocolate-covered cherries. These all ring a nostalgic bell for us. Here at Blair Candy, we wanted to provide you with a means to present that old-fashioned Christmas candy this season. Our cardboard candy boxes are one and 7/8 inches deep, three inches tall, and four inches wide. 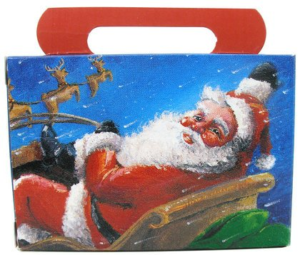 The boxes feature a classic illustration of Santa Claus being borne along in his sleigh by his reindeer, a truly traditional Christmas image. Or, if you prefer religious themes, we have another cardboard candy box featuring Mary and the baby Jesus. These boxes are intentionally non-commercial, inviting you to fill them with all kinds of nostalgic holiday candy treats and gift them to your family and friends. Give the gift of old-fashioned Christmas candy this year, and do it the way you want. Build your own Christmas candy boxes at BlairCandy.com! Every time of year kind of has its own candy themes. On St. Patrick’s Day you’ll see chocolate coins everywhere. Easter’s got all kinds of sweet bunnies, chicks, and eggs. Halloween’s known for creepy chocolate and gummy candy, and Christmas has delicious chocolates, candy canes, and so much more. But don’t forget that candy is also well equipped to take a back seat to larger sweets like pies, cakes, and ice cream. The combinations of candy and baked goods that you can make are nearly endless. For instance, suppose you wanted to prepare some ice cream sundaes for yourself and others and wanted an unusual topping that you were fairly certain everyone would love. 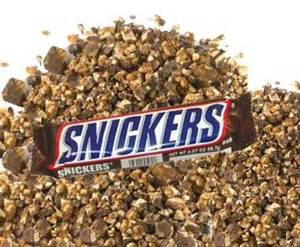 For that, we’d suggest Snickers chopped topping, a lovely Christmas candy in bulk that basically consists of Snickers bars chopped up into nugget pieces that are just perfect for dropping over a pile of chocolate syrupy ice cream as a nice extra touch. Or how about the same idea, but for a cake topping? This time, we’ll make that topping some chopped Reese’s peanut butter cups, little nuggets of scrumptious Reese’s chocolate and peanut butter. How could you say no to that? Seriously. Christmas candy in bulk is so much more than it appears. Whether as a main dessert dish or simply as a topping to an equally sweet baked concoction, this candy works either way. Check out your bulk candy at BlairCandy.com!